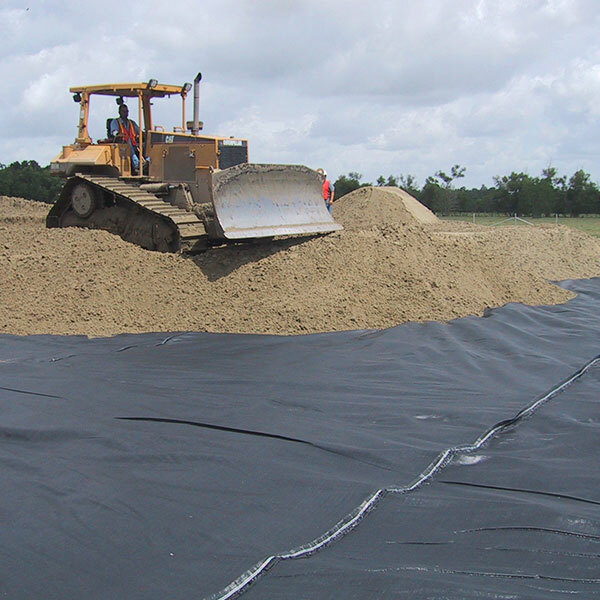 Geotextiles are produced from chemically-resistant synthetic fibers to prevent biodegrading. Standard weaving machinery manufactures the fibers into a flexible, porous fabric. They are then knitted or matted together by heat-sealing or needle punching. Although all geotextiles are porous, their mechanical and hydraulic properties can vary widely. Separation — Prevents the mixing of two layers of soil having different particle sizes. Performance criteria are AOS, tear, tensile strength, permeability, and permittivity. Filtration — Retains fine particles while allowing water to flow through. Acts as a filter rather than a drain. Therefore, it is important to consider performance criteria such as AOS, permeability, and permittivity. The physical properties of the fabric must also allow adequate flow, proper soil retention and resist clogging. Drainage — Gathers and discharges liquids or gases not required functionally by structure. Performance criteria are mass, transmissivity, and permeability. Reinforcement — Provides a tensile element to the soil matrix, thus providing more competent structural material. 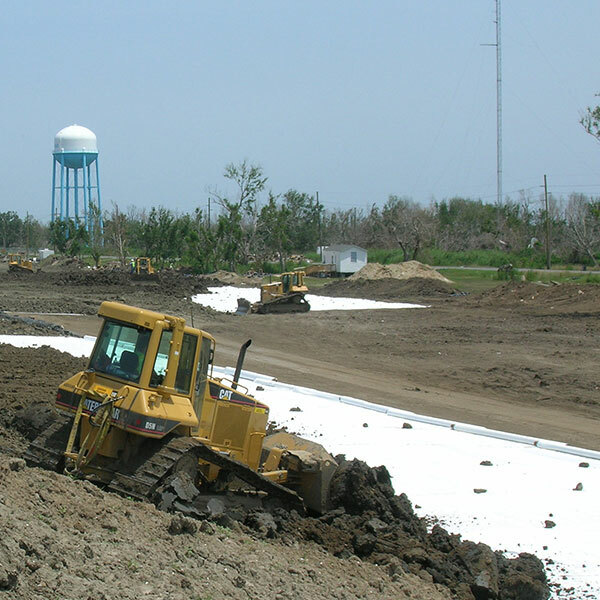 A geotextile must be able to transfer its strength to the soil it is reinforcing. It must also maintain its strength for maximum effectiveness. It must allow water to pass through readily while filtering out fine materials that can weaken the soil. Performance criteria are grab, elongation, tear and mass. Protection — Shields synthetic membranes from puncture, abrasion and perforation. Also referred to as a cushion layer. Performance criteria are puncture resistance, mass, and burst strength. Non-woven Geotextiles are a felt-like material made from polyester or polypropylene staple fibers. They are needle punched and then heat set. Two main categories of non-woven geotextiles are available. Civil series non-wovens meet typical weight strength and filtration properties, which is more cost-effective. Environmental series non-wovens meet the minimum average roll values (MARV) which may be required depending on the project. Please send us your specifications so we can help you determine the most cost-effective solution for your next project. Applications — High flow rate and small opening sizes. Functions as a filter fabric around a subsurface drainage system. Fabric collects fine sediments while filtering out water. For use along highways, within embankments, and on athletic fields. Applications — Specifically used for separation layers under rip-rap, in gabion baskets and under Envirogrid geocells. Also to hold soils in place for permanent erosion control. 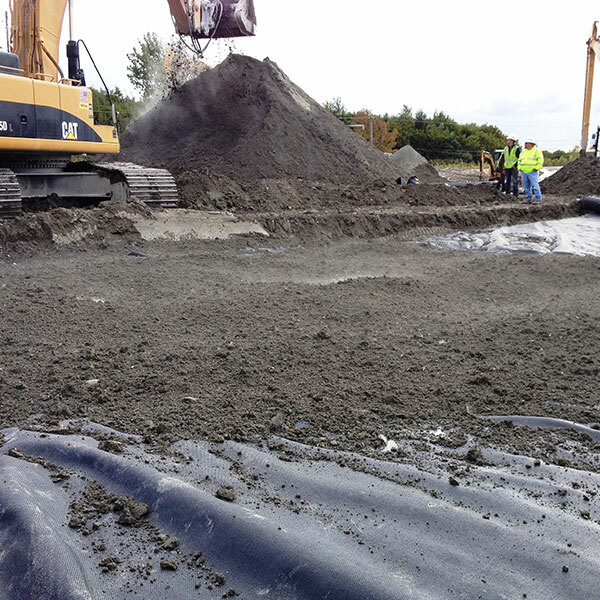 Applications — Cushion and protect geomembranes while providing abrasion resistance. Also used for stabilization under railroads to prevent the mixing of ballast with subgrade below. Applications — High load applications such as the protection of landfill liners and cells, railroad sub-grade protection. Also to wrap buried pipe and for environmental drainage control. Woven geotextiles are made from polypropylene or polyester fibers interlaced to create a unique fabric. Slit-film wovens have flat strands for strength while monofilaments have round fibers to create more uniform opening sizes for drainage applications. 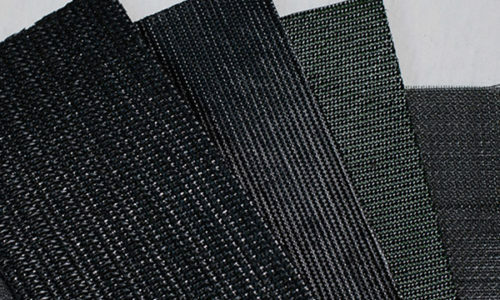 High strength and high performance wovens can also be knitted or woven to achieve the desired performance characteristics. Functions — Separation, filtration, stabilization and reinforcement. Excellent puncture and tear resistance as well as high tensile strengths. Lightweights for separation of good to moderate subgrades. Also for control of runoff and flow velocity, such as silt fences and temporary access roads. Heavy weights for separation and reinforcement. Also for the stabilization of weak subgrades for heavy loads or abrasive base material. Applications — Stabilization of weak subgrades such as unpaved roads, parking lots, access haul roads. Applications — Shoreline erosion control, geotextile tubes, filter bags, silt curtains, leachate collection systems, and inlet filters. Applications —Soil stabilization for railways and road construction, retaining walls, extra steep earthwork as well as for reinforcement of berms and levees. 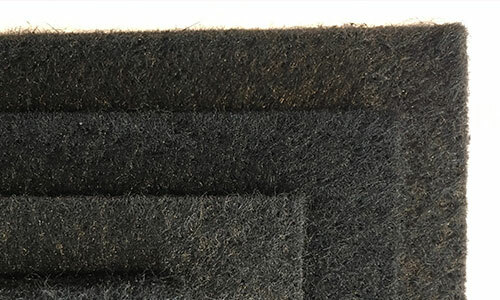 Are you looking for geotextiles in custom roll sizes or factory seamed panels? IWT Cargo-Guard offers factory seaming of geotextiles to custom widths and lengths. Seaming capabilities range from non-woven, slit-film wovens and monofilament wovens to the high performance/high-strength polypropylene (PP) and polyester (PET) geotextiles. We also offer off-line slitting and re-rolling with fast delivery to your job site. Please call us at 609-971-8810 for more information.